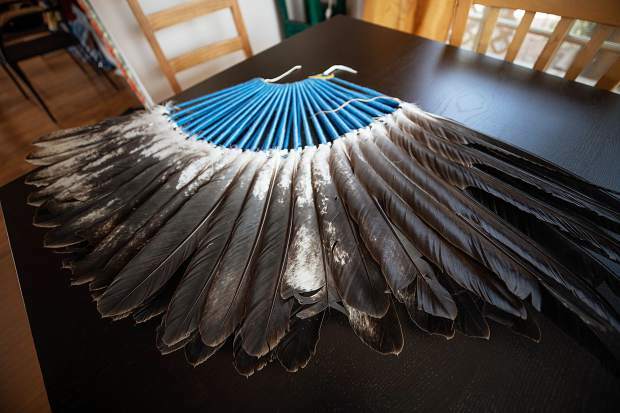 Anuk Bald Eagle spreads out his regalia that he has made from eagle feathers his family has given him on his kitchen table at his home in Woody Creek on Saturday afternoon. 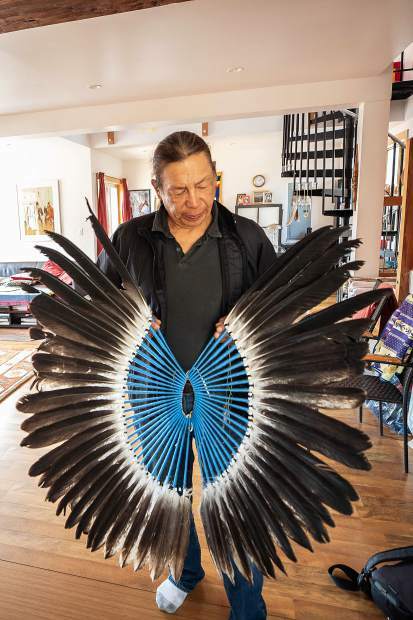 Anuk Bald Eagle holds up his regalia that he has made from eagle feathers his family has given him at his home in Woody Creek on Saturday afternoon. The Aspen Ute Foundation is introducing its first-ever powwow to the Roaring Fork Valley this weekend. To be held Saturday, the Shining Mountains Pow Wow is a nine-hour affair, complete with intertribal dancers, dignitaries and royalty from regional tribes, contest dancing and drumming, as well as cultural booths, arts and crafts, storytelling and indigenous vendors. 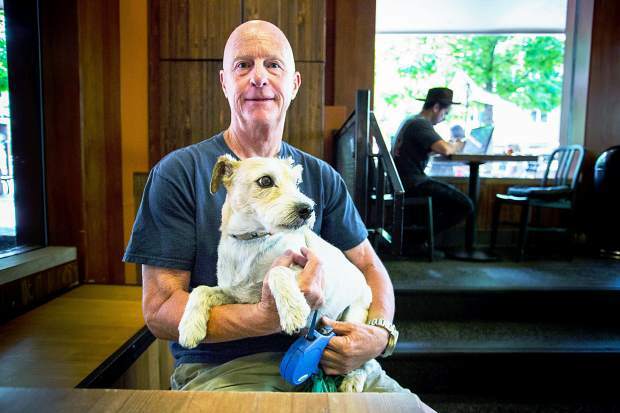 Deanne Vitrac-Kessler, founder of the Aspen Ute Foundation, said while the organization has had small gatherings here since it was established 14 years ago, people were coming to her asking for more. Preparations have been underway for weeks, with dancers creating their regalia. 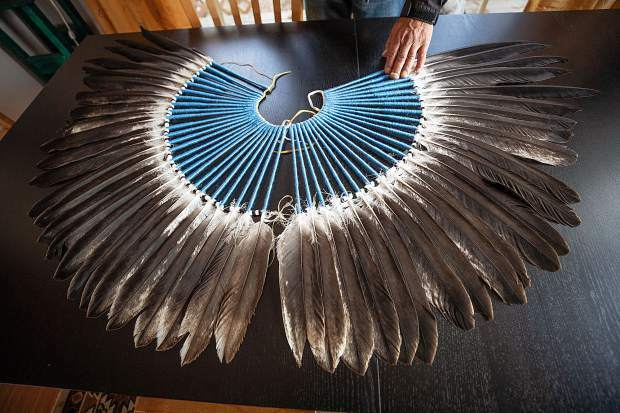 Anuk Bald Eagle, who helped Vitrac-Kessler in years past with Ute Foundation gatherings, is nearly finished with the regalia he’s been creating with feathers from a bald eagle he received from his family. 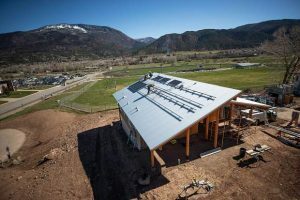 Aspen Ute Foundation was founded with Northern Ute Elder Loya Arrum-Cesspouch’s help to bring an indigenous presence back and the respect of ancestral territories to the Roaring Fork Valley, according to Vitrac-Kessler. 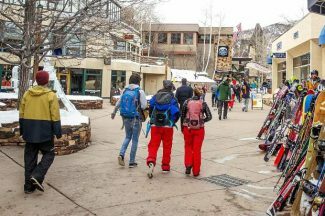 Foundation members have held exhibitions and dances in downtown Aspen over the years. Last year was the foundation’s first-ever indigenous film festival — the Shining Mountains Film Festival. Saturday’s powwow will be a much larger affair, with anywhere between 15 to 40 dancers from various tribes around the West. 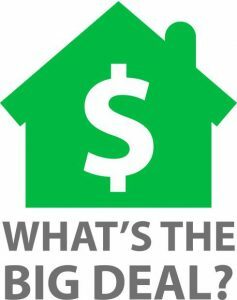 “This powwow has sparked the curiosity of many dancers and drummers in ‘Indian country’ and the Northern Ute Indian Tribe has expressed great interest in sending representatives of their council as well as royalties (selected dancers to represent the tribe),” Vitrac-Kessler wrote in an email. The Utes will be the host tribe with their Fort Duchesne, Utah, drum group, The Wild Salmon Singers. The guest drum group will be the Cherry Creek Singers of Cheyenne River Sioux Tribe, South Dakota. There will be champion dancers in different categories from diverse nations, such as Ute, Lakota, Hopi, Dine’/Navajo, Apache, Cheyenne, Cherokee, Paiute and Kiowa. 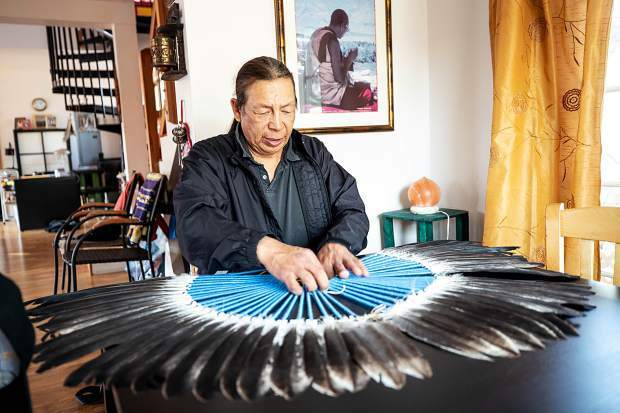 The Ute Foundation’s influence here has reached to City Hall, as it successfully pushed Aspen City Council to pass a resolution to replace Columbus Day with Indigenous People’s Day two years ago. The film festival, aimed at educating and bringing awareness to the public about original inhabitants of this continent, takes place during Indigenous Peoples Day weekend. Council members last week plugged Saturday’s powwow, saying it was a not-to-miss event. The powwow will be an indoor event at Aspen High School. From 1 to 4 p.m., there will be cultural booths, arts and crafts, children’s games, story telling, indigenous vendors and a raffle. Then beginning at 5 p.m., the traditional “Grand Entry” of all dancers will occur. And then until 10 p.m., a dancing and drumming contest will ensue, along with the intertribal dance that includes everyone present. The event is free for people under 18 years old; it is $10 general admission for adults.